Charles Preston Headland was born in Hougham but grew up on his father’s farm in Marston. His mother was Frances (nee Rawding) from Hough on the Hill. 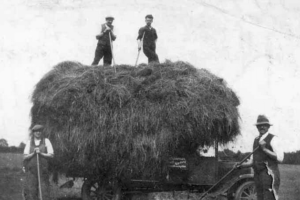 In 1905 he married Bertha Culpin in Grantham and continued farming in Marston. At some point between 1922 and 1942 they moved to Beechwood House, Lilley St, Long Bennington. As well at least 3 children who died in infancy, they had 5 daughters and 3 sons: Charles W (1906), Geoffrey Phillip (born 1913) and Hugh Steven (1919). Charles William. In 1953 Charlie was 46 and working as a charge hand at Ransome and Marles. He left his parents’ home (Beechwood House) with an old 12-bore gun to shoot rabbits. But his dog came home alone and Charlie’s mother found him shot dead in the paddock. The gun was in poor condition and may have gone off by accident. Geoffrey Phillip was employed as a lorry driver in the 1930s. One evening in December 1937 he was driving his Austin 7 saloon when a cyclist pulled out in front of him at South Muskham crossroads and was killed. Headland was cleared of any blame for the accident. He married Elsie Dixon and died in 1983. Hugh Steven (known as Peter) had served in the Nottinghamshire Yeomanry (Sherwood Rangers) in the 1930s, whilst working at Castle Motors in Newark. The Yeomanry, a volunteer cavalry unit, was mobilised in 1939 and sent to Palestine. In July 1940 it lost its horses and became a coastal artillery unit, taking part in the defence of Tobruk and Benghazi and the battle of Crete. In 1941 it converted to Crusader tanks and became part of 8th Armoured Brigade. 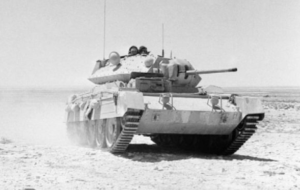 On the 24th October 1942, it headed the armoured attacks in the battle of El Alamein. Peter was killed that day. He was a sergeant and aged 22. He is buried at the El Alamein war cemetery.